Arsenal to make shock move for Chelsea captain? 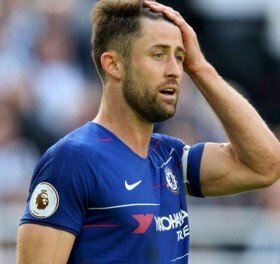 Arsenal are reportedly deemed favourites to secure the signature of Chelsea captain Gary Cahill amid the injury crisis which has hampered the first-team squad. The Gunners are already without Rob Holding with a season-ending injury while they have experienced fitness concerns with the likes of Laurent Koscielny, Shkodran Mustafi and Nacho Monreal. As such, the north London side find themselves short of recognised options at the heart of the defence and The Mirror suggests that Cahill is among those considered to reinforce the department. Cahill presently has seven months remaining on his existing deal and the Blues could be tempted to sanction his sale with a renewal unlikely amidst the defender's reduced gametime this season. Still, the Blues may seek to pursue another central defender before sanctioning his sale and the failure to do so may see them stick with Cahill for the remainder of his current contract. Meanwhile, Unai Emery has a selection headache in defence ahead of the Brighton game and it will be interesting to see whether Koscielny is brought into the fray to start alongside Sokratis at centre-back.